Hampstead is an area of northwest London, part of the Borough of Camden. It was the site of a spa from the seventeenth century until the late nineteenth century. The area developed as an affluent suburb following the opening of the North London Railway in the 1860s. Everard Hopkins was born in Hampstead, London, on February 5, 1860, to Catherine Smith and Manley Hopkins. He was the youngest in a family of seven children, the eldest of whom was the famous Victorian poet and Jesuit priest, Gerard Manley Hopkins (1844-1889). Another elder brother, Arthur Hopkins (1848-1930), was a well-known artist. Hopkins attended the Charterhouse School and completed his post-secondary education at the Slade School of Fine Arts in London (1878). After completing his education, Hopkins became the Assistant Editor of Pilot. He also worked as an illustrator for various magazines, including Atalanta, for which he illustrated Clemence Housman’s The Were-Wolf (1890). Other magazines included Woman’s World, The Graphic (for which he drew for wood engravings from 1883-1885), Illustrated London News (1887-1892), Quiver (1890), Black and White (1891), and Punch (1882-1895) (McDermott, A Hopkins Chronology; Engen, Dictionary of Victorian Wood Engravers). Hopkins also illustrated books; examples includeLaurence Sterne’s A Sentimental Journey Through France and Italy (1910), L.T. Meade’s The Children of Wilton Chase (1911), and Alfred Lord Tennyson’s The Princess (1911) . 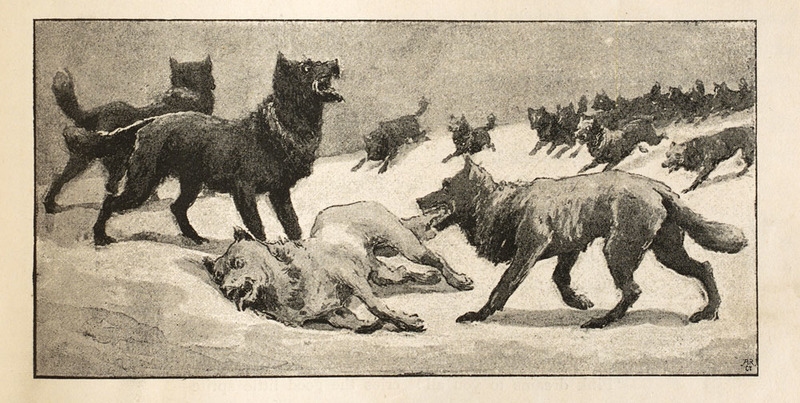 "Wolf Pack with Dead White Wolf," for Clemence Housman's The Were-Wolf in Atalanta Magazine (vol 4.39), illustrated by Everard Hopkins. The Were-Wolf Gallery.